Marcia G finished ‘Galaxy’ long before the year was up. ‘Galaxy’ was a year-long project with a designated area to finish each month. Some stitchers, however, are so skilled and goal-oriented they were able to cross the finish line early. Marcia G. and Barb C. were two such speedy stitchers. Barb C. shows a finished Galaxy! Finishing needlepoint pieces into framed, filled, stuffed or edged accessories is always considered an accomplishment. Members much appreciate the stitching and sewing that creates an enjoyable addition to the house. Stitchers Marcia G. and Barb C. used different thread colorways, as can be seen in these pictures. Their choices give completely differing looks to the same design. It is part of needlepoint pleasure to experiment with colors and their relationships to each other. One secret learned by needlepointers everywhere is that there is a certain color that can bring a piece of needlepoint to life. It is called the ‘poison’ color, no matter which color it actually is, because of its surprising effect on all the other colors. It jolts and startles the eye, but, like a black lampshade in a beautifully decorated room, prevents an overall feeling of too much sweetness. So go ahead, throw an acid green onto those pinks and cranberry colors and see what happens! 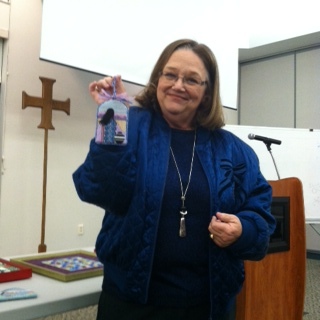 Gloria showed lovely Southwest-themed ornaments she’d stitched. Members have been busy stitching and finishing, and it’s always fun to see the new results. Here, Cynthia shows what can be done by slightly altering a design. ‘Honey I Shrunk the Heart,’ our current project, is shown here stitched not as a heart, but as a square, and finished in a frame. 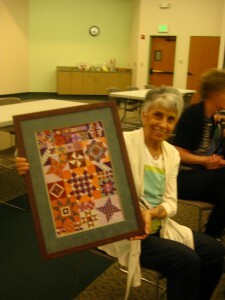 Cynthia chose delightful colors, and gave a tip about selecting threads for this project. Choose the variegated thread first, then add the other colors that fit or match it well. This project will continue into February (when the meeting is on TUESDAY, FEBRUARY 18 DUE TO THE PRESIDENTS’ DAY HOLIDAY when the church is closed that Monday). 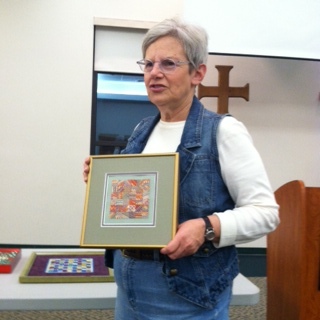 Cynthia showed ‘Honey I Shrunk the Heart’ stitched as a square. 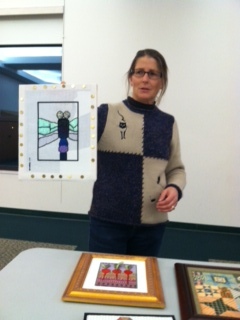 And below, Jennifer shared her creation which is double-sided, people! She has stitched it to show either front or back. Both are beautiful! She said this is an idea she’s been wanting to experiment with for a long time. The next meeting of Colorado Columbine Chapter of American Needlepoint Guild is Monday, January 20, 2014 at Bethany Lutheran Church, starting at 6:50 p.m.
We will get to see the results of the year-long project called ‘Galaxy,’ stitched by several members, then we get to launch another beautiful project called “Honey, I Shrunk the Heart!” designed by Pat Timpanaro. Our own Cynthia L. will be teaching this class. Select a skein of overdyed silk or cotton that contains the colors you want for your heart. You should be able to find three different color families in this overdyed thread. These will be Colors A, B, and C. Following the Materials List above, select colors of pearl cotton, floss, and Kreinik metallic. The values (light, medium, or dark) that I used were ones that were pleasing with my particular skein of Floss Overdyed. Choose values that complement your overdyed thread. You will use most of the skein of overdyed thread, but only a yard or two of each of the pearl cottons and Kreinik braids, so this is a good project to work from your stash. If you want to have a background, choose a color that contrasts with the colors in your heart. You will need floss, #5 pearl cotton, and Kreinik #16 braid (or 1/16″ ribbon) in same color. You might find it easier to select the Kreinik metallic first and then pick the matching cotton. You will need a full skein or spool of each thread for the background. This is a great project to use your stash of needlepoint threads! Think rosy pinks and peaches! We will continue this project at the February meeting, so there will be plenty of assistance available if needed. Also, we are planning a March project called Sharon G’s “Watering Can with Hydrangeas,” which can be paid for at the January or February meetings ($85 which includes a stitch guide). It is a beautiful canvas, as fans of Sharon G. can imagine. Lots to look forward to with stitching needlepoint this spring! 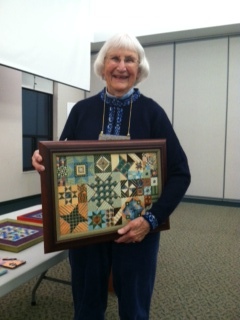 Needlepoint stitchers from Columbine Chapter will want to get these beauties on the calendar in 2014! Expert instruction, beautiful threads and canvases, new designs are all on tap for all members to enjoy. 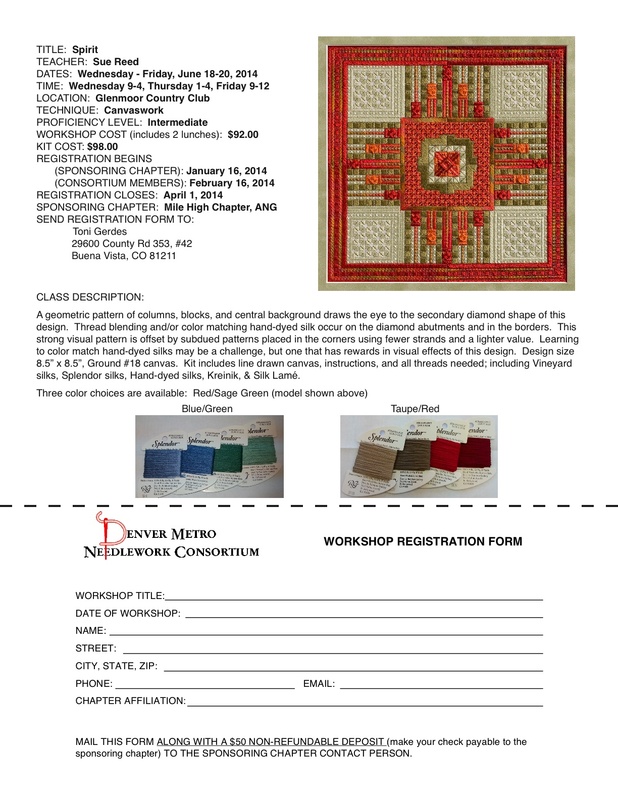 The Denver Metro Needlework Consortium serves us all and brings together the best in Colorado needlepoint offerings. Don’t forget our General Meeting on Monday, January 20 (Martin Luther King Jr Day, and yes, we meet) at 6:50 p.m. at Bethany Lutheran Church. 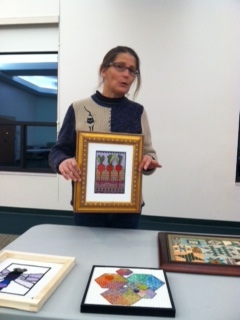 Barb shows a magnificent finished piece at a recent Show & Tell. The Colorado Columbine Chapter of the American Needlepoint Guild, Inc. (ANG) is a non-profit organization dedicated to the encouragement and education of needlepoint. We meet on the third Monday of every month (except August and December) at 6:30PM. Please visit our Chapter Information page for more details! Honey, it’s time for spring needlepoint! 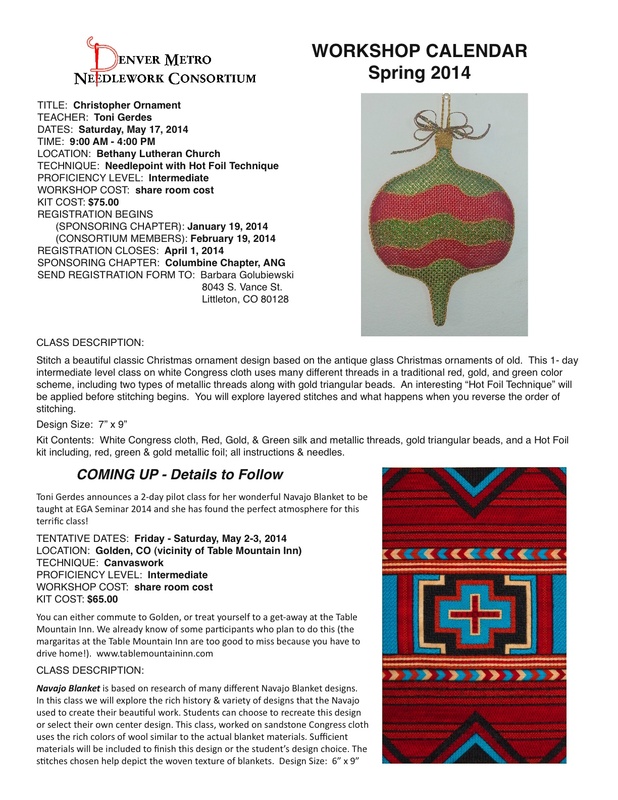 Annual dues could be free for Colorado Columbine Chapter needlepoint guild members! Denver stitchers are off to ‘visit’ Vietnam in October! September special — show your favorite needlepoint!